During the Fifties and Sixties many popular singers had their own television show some were sponsored and others were on public television.They ranged from Dean Martin, Bing Crosby, Rosemary Clooney, Nat King Cole and of course Frank Sinatra. These two DVDs have two each of his Tmex Shows on DVDs and were broadcast in 1960, they are in black and white and are in the 4:3 screen format but can be viewed in the wide screen format but that does tend to give some distortion. In many these are variety shows with singing, dancing and humour but first and foremost it’s the singing that attracts the average viewer. 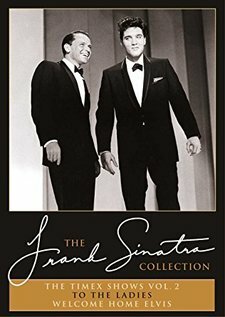 The first show on Volume One is simply entitled The Frank Sinatra Timex Show and was first shown in October 1959 and has guest appearances by Dean Martin, Bing Crosby and Mitzi Gaynor with a brief appearance by Jimmy Durante. It is the singing which captures the viewers attention with individual spots by Dean Martin, Bing Crosby and Frank Sinatra himselfmmmercial recording but there is collaborations with all three singers.. The dance sequences with Mitzi Gaynor are fine if you have a passion for this type of thing but it only bears only one viewing. The humour feels forced rather than spontaneous and is obviously scripted. The second show on Volume One is titled An Afternoon With Frank Sinatra follows the same pattern as the first show and has guest spots by Peter Lawford, Hermione Gingold, The Hi Los, Red Norvo’s Jazz Combo, Juliet Prowse and Ella Fitzgerald. It is Ella and Frank who take the honours and their duets are joy.and their individual ballad readings are spot on. Volume Two opens with To The Ladies and features guets Lena Horne, Mary Cota, Barbra Heller and Juliet Prowse with a special guest appearance by Eleanor Roosevelt whose reading of the lyrics of High Hopes is the highlight of the show, she gives it more feeling than the lyrics deserve. The final show is titled Welcome Home Elvis and obviously is intended to feature Elvis Presley’s return from serving in the army, he makes a fine job of Witchcraft / Love Me Tender aided by Frank Sinatra. There are also guest appearances by Nancy Sinatra, Sammy Davis Jnr., Peter Lawford and Joey Bishop. 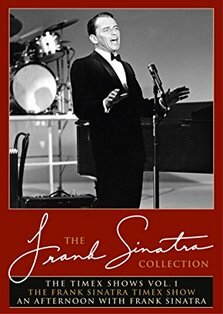 It all will seem dated to today’s viewers but there is lots of nostalgie and some of the singing is well worth a listen and some of Sinatra’s songs have never received a commercial release.